It is common to hear Democrats blame California’s ongoing severe drought on climate change. Gov. 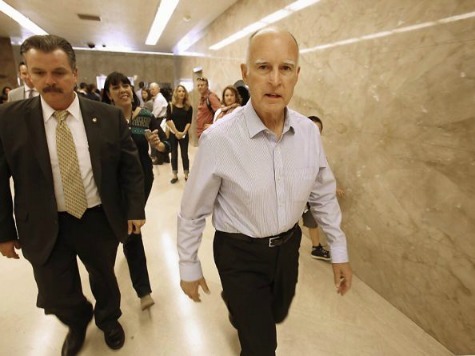 Jerry Brown made that claim last week in his “state of the state” address. Now a Republican is also claiming that California’s drought is man-made–by Democrats. Rep. Devin Nunes, who represents the largely rural 21st congressional district, made the claim while appearing on the Laura Ingraham show Thursday morning. “What the founding fathers of our state did, including Jerry Brown’s own father, is they built water systems that could withstand five years of drought, and that could move water from the hills of the Sierra…and move it around to where the people now live. And what the difference is here, is that over the course of the last 20 years, and especially the last 5 years, those systems that have been built have been essentially shut down,” he said. As bad as the drought it, Nunes said, it was “entirely predictable,” and Democrats exacerbated its results. Nunes described the controversy over the Delta Smelt, the endangered fish species that is the focus of federal government policies that limit the amount of water that can be pumped into irrigation infrastructure in the Sacramento-San Joaquin River Delta. “Our area, Laura, has been decimated because it’s been easy for them to cut off water to the farmers….They use water as a weapon, politically.” Nunes added that “their madness has caught up to them,” because water restrictions were starting to affect liberal voters in the San Francisco area. Though Nunes had harsh words for the Democrats on water policy, he is considered a moderate, and was also harsh towards Republicans–“lemmings with suicide vests” during the federal government shutdown last fall.